I'm very pleased with the product and service. 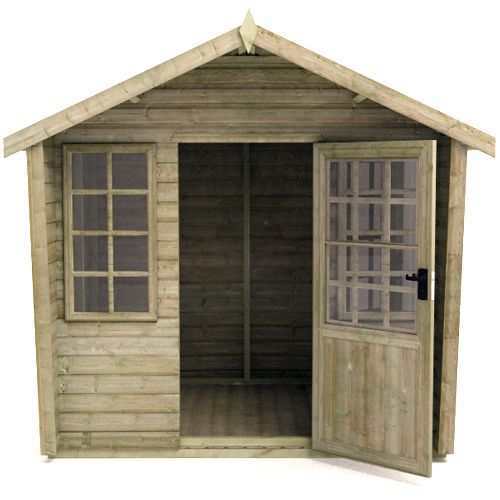 The summer house is top quality and good value. As a professional landscaper I've erected many out door buildings and this was a delight. I am impressed with the way this company runs itself, the communication is good and I was given a two hour time slot (rather than the 8 till 6 that other companies seem to offer). This meant that i didn't have to wait around all day which in itself has a high value. 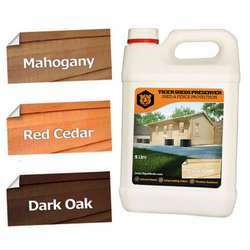 I recommend this company and will use again. 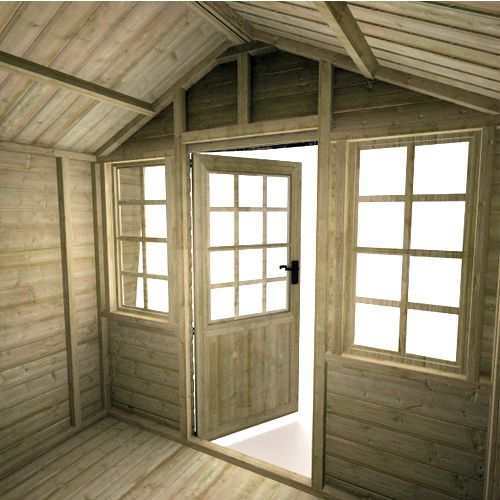 Fantastic Summer House, well-built and great service and delivery. Thank you. Overall I feel this product does represent good value. 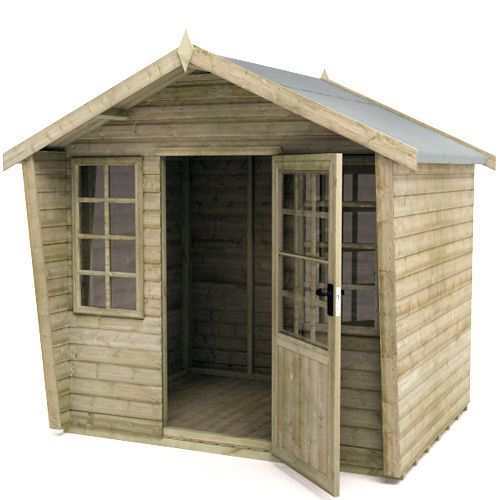 I looked at many different sheds and summerhouses before deciding on this one. You do get a lot of timber for your money with this one. 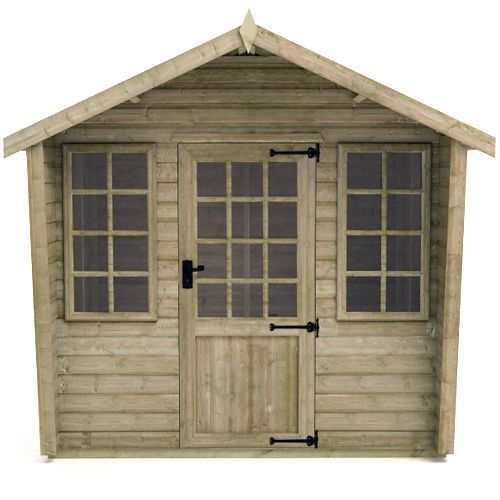 It is very sturdy and less than a quarter of the price of some summerhouses this size . It did need a little bit of finishing, all within the capabilities of any DIYer. I added a couple of bits of 44x44mm timber to the front of the roof to make a tidier finish to the roof felt and so that the barge boards fitted better. The door was a bit tight at the bottom and I think you really do need to fit the glass in with some beading, to improve the appearance. As with any garden building it does need painting. Previous comments refer to water getting in through knot holes. I used a golf ball sized piece of wood filler to fix that on mine so not a big problem. It is important to recognise that tanalised timber will absorb water. I put three coats of Sadolin classic mahogany on the outside and one coat of clear on the inside. 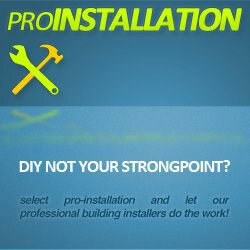 (It is easier to paint the underside of the roof before its erected). After the weather during August and September this year I can say with certainty that it is now fully waterproof. I have bought lots of Tiger Sheds over the years and now always but the tanalised versions. 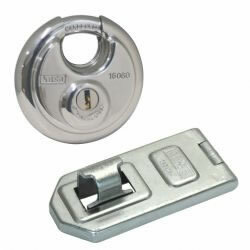 They are excellent quality and properly joiner-made which makes a big difference. We had a problem with broken glass for the windows on delivery but Tiger quickly sorted out replacements without any fuss. For the price you simply cannot beat these so I would definitely recommend them. An excellent purchase. The materials and pre-built sections are to a good standard. The panels are strongly made. It does take two to move into position and build. Delivery was on time and driver very helpful. The summerhouse was easy to erect in less than 3 hours for the 8' x 10' self build and looks great. 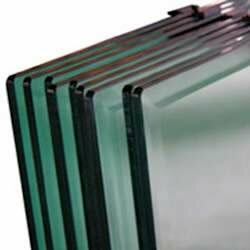 We are very glad we choose the tanalised wood and the glass option. Well done to all involved. Highly recommended. We are very happy with our purchase it is strongly made and looks very good in our garden. We were very glad we took advantage of the probuild option. The construction team was most efficient and did an excellent job in a remarkably short time. We are extremely happy with our recently purchased Elite Summerhouse - it went together like a dream and fits perfectly into our garden. 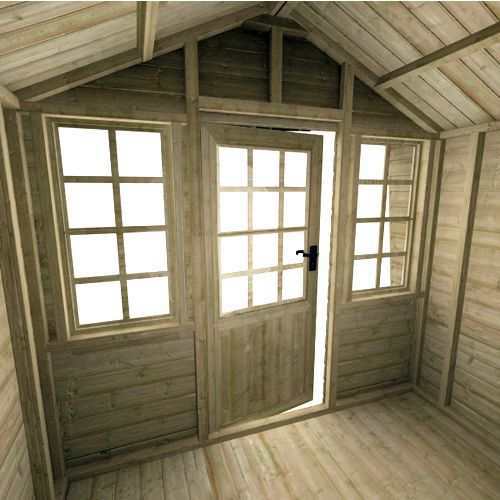 It must be the best engineered shed on the market, the tanalised timbers make the shed the best looking summer house Ive seen. Pass on my thanks to your driver, how he managed to carry the various parts I cant guess, perhaps he should enter Britains strongest man competition. 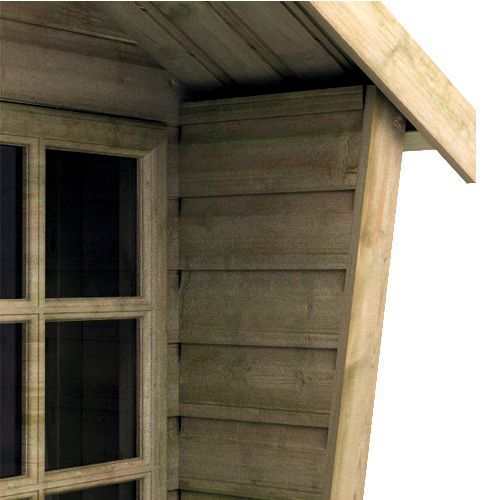 I hate to do this sentence you know the one but Sadly only one thing spoils the overall effect the felt roof, I know its pricey but shingle would look 100 times better and should be included as an option? Really pleased with my purchase, i'm glad I spent the extra money and went with this pressure treated model its very sturdy and well made throughout. Im no DIY expert but the building was fairly straight-forward to put up- went up in about 2 hours, so no complaints there. 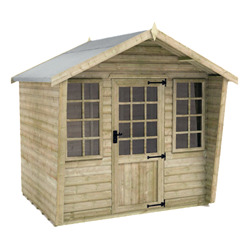 Definitely recommend this product to anyone thinking of a summerhouse and I didn't have to wait too long for delivery as it arrived last Friday and I only ordered on the Monday. Thanks.